The recent edible highlights in my life can be summarized as follows: Caesar Salad and Chocolate. The chocolate came about because of a couple of small celebrations. And both times, Alice Medrich's beautiful cookbook Sinfully Easy Delicious Desserts delivered with great recipes. I'm glad I thought to leaf through the book on my own shelf rather than hitting up the Internet looking for a recipe as I tend to do. 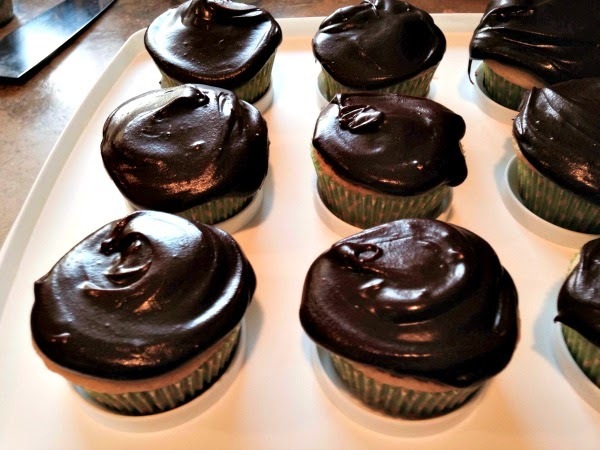 The first was a birthday celebration at work, and I made a dozen vanilla cupcakes with mocha fudge frosting. This frosting is an excellent option for the buttercream-averse (me!) and it calls for cooking together butter, sugar, cocoa, espresso and cream, then letting the mixture cool into a thick glossy fudge to be spooned onto cupcakes. So easy and oh so good. And given the magical inbuilt portion control of cupcakes, I enjoyed one and the rest were devoured by co-workers. Then yesterday we had V's colleagues over for Indian food. Well, everything but the dessert was Indian food. We had the standard oldies but goodies of green bean patties and faux sev puris (faux because of the tortilla chip base and the cranberry chutney instead of the usual tamarind-date one- using what I had in the freezer), egg curry, chana masala, roasted cauliflower, raita and rice. For the dessert, I broke out the springform pan and tried something new- Medrich's Queen of Sheba Torte version 5.0. 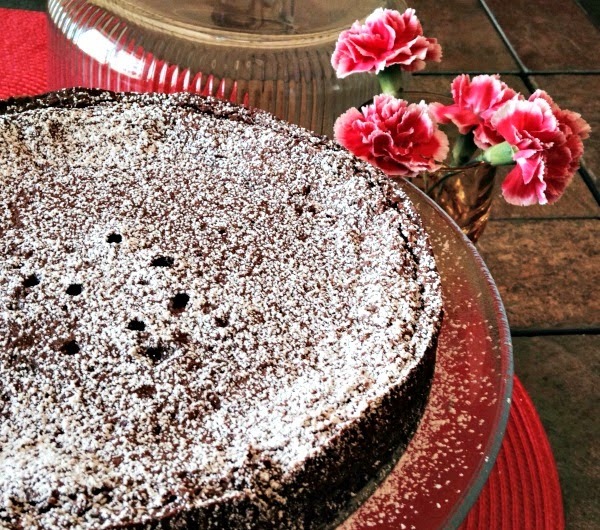 It is a dense, creamy, RICH, nearly flourless dark chocolate cake. Easy to make and elegant, at least by my modest standards. V whipped up some raspberry cream to serve with it. I think this will be my go-to company dessert for this year. A tiny sliver is so decadent and satisfying, which is exactly what I'm looking for in a dessert these days. Sweets apart, I've been gorging on fresh greens. A good salad dressing can make raw greens irresistible. This is my interpretation of a classic Caesar salad dressing. The dressing can be made ahead of time and stored in the fridge but I usually make it as needed in under 60 seconds. This amount of dressing serves 1 or 2. Toss with fresh greens and shredded Parmesan cheese (Sartori from Wisconsin is my favorite and I can find it in the local supermarket). Serve right away. Have a great week and I'll see you next Monday with a round up of books and TV from this month. I am drooling over the cupcakes! They look delish! The recipe for faux sev puris is at the end of this post, Sangeetha. Gosh those cupcakes look sinfully good!! And thanks for the salad dressing recipe. Can I use egg-free mayonnaise instead of Hellman's? Also, what can I substitute for the capers? Not sure I can find them where I live. And lastly, what is that yummy looking dish next to the salad? Any mayo would work! Minced olives might be nice instead of capers. 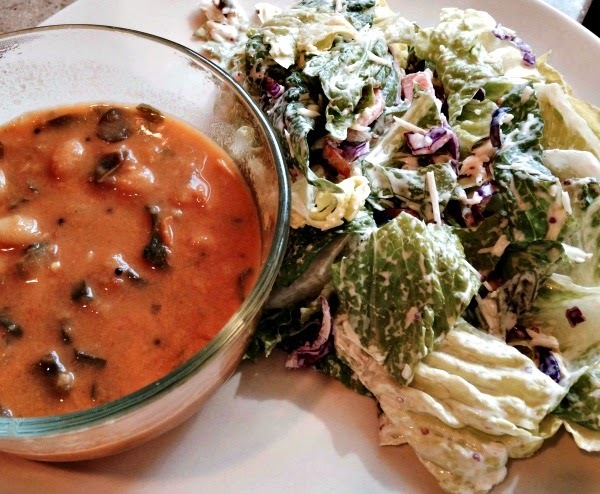 Next to the salad is a dal/soup of white beans, methi and coconut milk. I do make a vinegar dressing and love it. My staple dressing is balsamic vinegar, olive oil and mustard. A touch of honey would definitely be nice! This dressing sounds yum will try for sure nd the cake looks gorgeous,. That frosting looks so delicious! I could happily have it on its own. That cake looks amazing too, I am so tempted to try it after reading the description. I'll check to see if we have this book in our library. I also end up looking up recipes on the internet than referring the books I own whereas the very reason I own those books is because they are so great and trustworthy. I also need to use my books more often. Thanks for the reminder. We enjoyed some really nice vegetarian tamales from my local produce market and indulged in homemade kolhapuri misal and bhel over the weekend. Question (silly, maybe!) - Chana masala = chhole? I know that both items show up on restaurant menus, hence asking. I think of them as the same, Lakshmi. The salad looks good too. I made a radicchio salad yesterday from couple of radicchios I picked up at the farmers markets on a whim. I have never cooked with them, and made a salad. It turns out that radicchio is super super bitter! More bitter than arugula. Nevertheless we ate the salad just because we didnt feel like wasting such fresh produce. I made a dressing with fresh orange juice, honey, salt, pepper and lemon. And added some cranberries and cut up orange for sweetness. Neha- the frosting is in the book Alice Medrich's Sinfully Easy Delicious Desserts. Your public library may have a copy. Radicchio is super bitter, yes! Good idea to sweeten it up a bit. Oh! I love SarVecchio from Sartori as well. Did you know the backstory behind this cheese? When Kraft shut down the plant that initially produced this cheese, the workers at the plant pooled in their money and bought the plant from the owners. Then they sold the plant to Sartori. Have you had other Sartori cheeses? I always see big wheels of their raspberry cheese at the supermarket but I always pick the SarVecchio. This is a great dressing recipe by the way - I made a similar dressing once but I added Tahini instead of the mayo and a splash of apple cider vinegar instead of capers. I did know the back story and it is interesting! I haven't tried any of their other cheese. We usually buy the other- pepper jack and cheddar- from Trader Joe's but this is the only parmesan I like. Tahini is a wonderful base for dressings! Hi Nupur, Have you tried any recipes with Ragi / nachani flour? I believe it is full of protein. Not sure of its carb content. But if you have any ideas, it can be a good substitute for wheat rotis in the context of reducing carbs. Mira- I do love ragi flour and use it occasionally in dosas. Like most grains, it is about 90% carbs. But does have some 8% or so protein. Thanks for the info. I was not aware that it is 90% carbs. So would something like moong dal chila for e.g. be a reasonable substitute for roti then? Apart from veggies and salads, it is little hard to figure out what to use instead of rice or roti to feel like you've had a meal! Mira- Whether a moong dal chila would be a reasonable substitute for rotis depends entirely on what else you're eating at the meal, what else you're eating that day, and what your personal goals are in terms on how many carbs you want to eat. Moong dal (and other beans/lentils) have carbs too, but they also have protein and fiber. As for low-carb substitutes for rice, search for cauliflower rice. People make tortillas with almond/coconut flour too. I can tell you for sure that even when I totally skip the rice and rotis, I always feel satisfied and like I've had a good meal. So I don't feel like I am missing anything. Nupur we are using your dressing with salad this week. It is delicious. We didn't have the capers at home but it is still good. I have a really simple dressing that I like as well ( apart from the usual balsamic- olive oil one) - it's a little bit of sugar, a dash of salt and lime juice. So glad you enjoyed the dressing! I love using the sugar, salt, lemon one for Indian-style salads (cucumber, tomato, onion, radish ones). Very simple and tasty. The frosting sounds good to buttercream averse me as well. I end up doing whipping cream topping and now I have one more. Thanks! Whipped cream is a good one! This one is sturdier at room temp.